(Miami, FL) – Following the massive success of The Art Plug Power House’s debut during Miami Art Week 2018 which attracted over 3,000 attendees, Miami-based curator and art world personality, Marcel Katz (@TheArtPlug) is set to launch the second iteration of his new conceptual platform during ArtPalmBeach this month. Produced by Katz and his bespoke art agency, The Art Plug, the second iteration will feature over 10 contemporary artists from across the globe, including Kourosh Keynejad, C.B. Hoyo, Matthieu Venot, Tiago Magro, and Ketnipz, who will join forces in converting over 3,000 square feet of the fair into a multi-faceted space exhibiting sensory art works and installations located in the fair’s pavilion. "We’re thrilled to be bringing The Art Plug Power House experience to such an iconic show. I am overwhelmed by the success during Miami Art Week and look forward to seeing the show through the eyes of a new audience” – says Marcel Katz. From C.B. Hoyo’s interactive experience will guide guests through a fake art gallery revealing a clandestine art forgery shop hidden behind, guests will be able to enter a life size “Scent Bubble" by Detroitwick and walk through a live recreation of one of artist’s RhymezLikeDimez famed music video scenes. Ketnipz artist Harry Hambley will make his way across the pond from the U.K. to present the signature “Bean” in a sculptural dinner party. On Sunday, January 20 – Marcel will lead a panel discussion at Art Palm Beach entitled “Mastering the Art of Instagram” about the effects social media has had on the art community. The panel will explore social media platforms and how they created a new wave of digital art disruptors that are changing the way we observe and discover art. The panel will be open for audience questions after the moderated Q&A segment. The Art Plug Power House will kick off at ArtPalmBeach on Wednesday, January 16th during the fair’s official media preview. Following the preview, the 4-day public exhibition will be open to the public on Thursday, January 17th through Sunday, January 20th. Guest admission to the fair is $15/pp online and $20/pp at the door. To learn more information, please visit www.theartplugpowerhouse.com or follow on Instagram at @theartplugpowerhouse. Head to THE ART PLUG POWER HOUSE, a police impound property turned into an adult playground, during Miami Art Week (Art Basel) on December 7 & 8, 2018. Guests will be welcomed inside to find a variety of art installations and experiences powered by High Hemp featuring 31 influential, trendsetting artists from around the globe. This is not just any art show, it is a fully immersive display of the arts celebrating culture and craftsmanship. Guests will be immersed in interactive art curated by Marcel Katz of The Art Plug. 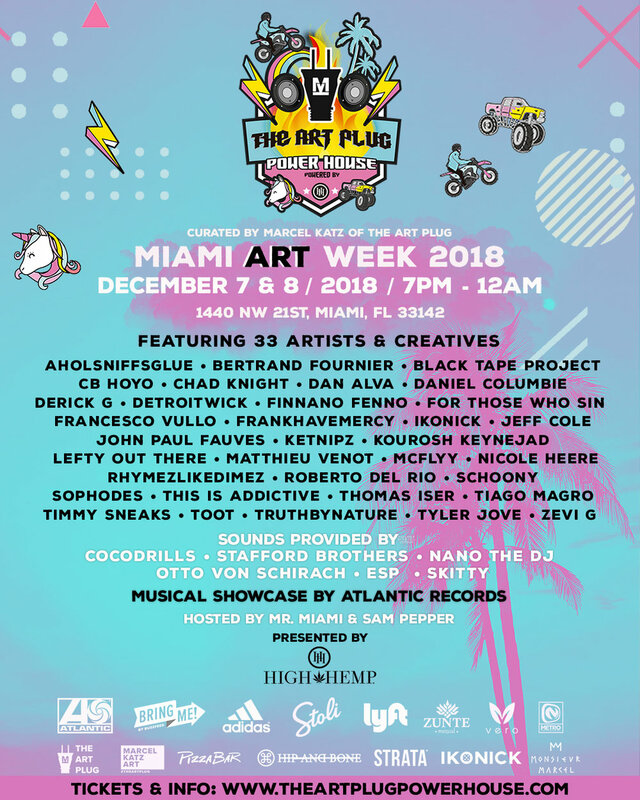 THE ART PLUG POWER HOUSE will be an unforgettable experience and the highlight of Miami Art Week by detaching from the real world, while providing you with a sense of liberation unlike anything you’ve experienced before. Over 30 interactive art activations and installations. Performance art combining alluring visuals with live performances at the High Hemp Stage by special guest DJs COCODRILLS, Stafford Brothers, and more. The Art Plug collab pop-ups with clothing brands Strata and Hip + Bone. Monster truck and Sniper Gang street bike shows hosted by featured artist Aholsniffsglue. Stoli Gold VIP lounge - gold & money themed. The next Ketnipz pop-up store at 393 Broadway in New York City on June 1st and 2nd will be a cluster of the artist’s most recent creative endeavors. Inspired by the idea of expression through customization and craft, the show will revolve around typical art forms, and how they bleed into everything else. It is also all about collaboration this time, as Ketnipz works with two separate companies to create unique items of clothing and artwork. Working with the up-and-comic denim repurposing company, AndAgain, both brands have come together to create 6 bespoke pieces of apparel, with a strong focus on re-imagining worn-out jeans. Then, through working with The Art Plug, Ketnipz will present 4 original pieces of art, along with a limited run of prints. The limited edition prints will also be available online on Thursday, May 24th at 10am PST on www.monsieurmarcel.net. There will also be a small line of custom t-shirts to celebrate the event, and donuts to celebrate National Donut Day. You can find Ketnipz on Instagram @ketnipz and join him in NYC on June 1st and 2nd for the pop-up at 393 Broadway featuring original artwork, limited edition prints, and branded clothing. Marcel Katz with The Art Plug and Rolling Loud founder Matt Zingler have teamed up to bring art to the world’s largest hip hop festival for the first time. ‘The Art Plug Trap House’ is a nearly 3,000 square foot space on the festival grounds that will be packed with artwork and installations by a lineup of 7 artists, who are transforming the area into an interactive, insta-worthy exhibit with disruptive and REAL art. Nychos will be live painting his colorfully morbid murals on massive (11 foot) canvases throughout the weekend, along with Cuban artist CB Hoyo who will live paint canvases and furniture in an exhibit outfitted with giant neon signs flashing messages like “Buy Art Not Drugs” (with a secondary reading “Well… Buy Both”). Festival-goers can snap selfies in front of a gold money bag by Zevi G, and can literally step inside of a giant 8 foot pill bottle installation created by Shawn Kolodny. To pay homage to performers – Somehoodlum will create life-sized art installations including a Migos Stir Fry and a giant N.E.R.D.S. box. LeftyOutThere will be live painting on photographs by Stillz of hiphop artists that performed in the past Rolling Loud. The exhibit will be open Friday, May 11 to Sunday, May 13. Monsieur Marcel will also be releasing exclusive limited works with these artists after the music festival. Music festivals are an opportunity for fans and artists to celebrate their passion for various forms of art. From music to visual installations, Rolling Loud aims to give attendees a memorable experience they will look forward to every year, and it has succeeded. It was important to Katz and Zingler to implement visual art into this year’s festival to give artists a larger platform to communicate their ideas and generate discussion. Make sure to stop by The Art Plug Trap House to enjoy these installations throughout the weekend. 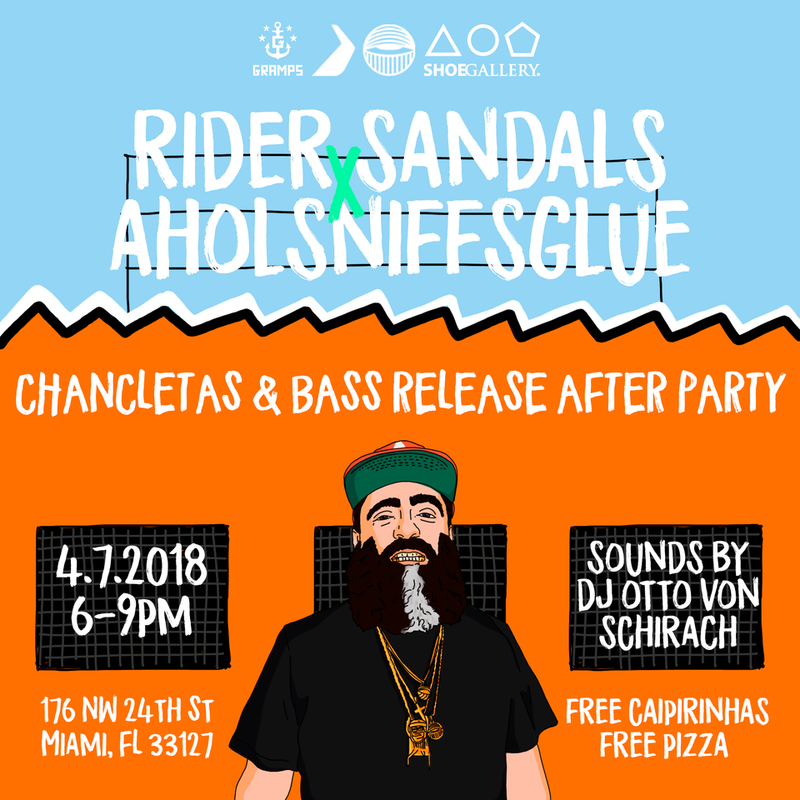 This coming Saturday, Rider Sandals and the Miami street artist AholSniffsGlue will celebrate the release of an exclusive #MiamiFullTime sandal collection design by AholSniffsGlue with two events in the city—a launch at Shoe Gallery followed by an after party at Gramps featuring free drinks, food and music. The Miami New Times has called AholSniffsGlue “one of the Magic City’s quintessential street artists” and the artist’s trademark eyes can be seen throughout the city. Rider Sandals was started in Brazil in 1986 and remains one of the country’s most celebrated brands. The collaboration brings the spirit of the Miami streets to a brand that has stood for freedom and expression since the beginning. The launch, which takes place on Saturday April 7th between noon and 6pm at boutique sneaker shop Shoe Gallery, will be the spot to check out and purchase items from the new collaboration. Following that, an after party at local nightlife staple Gramps will keep the celebration going from 6 to 9pm. The party will feature a 24 speaker “wall of bass” controlled by the legendary Miami experimental electronic musician and DJ Otto Von Schirach as well as free drinks and pizza for everyone who purchased items from the #MiamiFullTime collaboration. Both events are not to be missed! 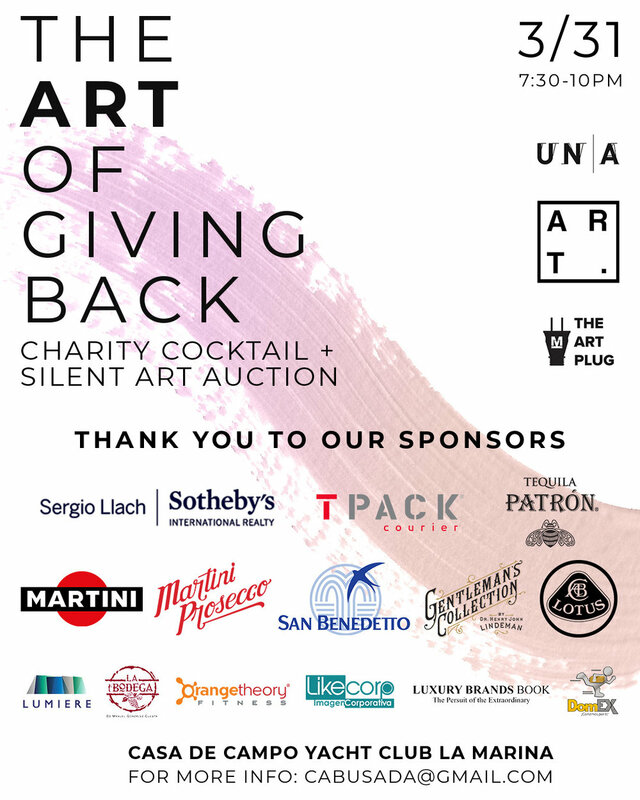 Join us for “The Art of Giving Back” presented by UN/A Art-Visor and ART. on Saturday, March 31st for a night of cocktails, music, food, and a silent art auction benefiting two important foundations. A percentage of the proceeds will be donated to Dominican Republic based charities, FACCI and Fundación De Valle. The Friends Against Childhood Cancer Foundation, Inc. (FACCI) is a nonprofit organization dedicated to improving the lives of impoverished children living with cancer. Fundación De Valle is a charity focused on helping children with special needs and children living with HIV or AIDS. The silent art auction is curated by Marcel Katz of The Art Plug and features works by international artists CB Hoyo, John Paul Fauves, Ketnipz, AholSniffsGlue, and Shawn Kolodny. The silent art auction will give attendees the opportunity to bid on pieces with a percent of proceeds donated to the two foundations. Any unsold art will continue to be displayed in the gallery for one month after the event. Guests will enjoy complimentary cocktails and refreshments by La Bodega, Patron, Martini, Martini Prosecco, and San Benedetto. The event is sponsored by TPACK and Sergio Llach of Sotheby’s International Realty and will be hosted at the beautiful Casa De Campo Yacht Club La Marina. Supporting sponsors are Gentleman’s Collection, Likecorp, Lumiere, Luxury Brands Book, Orange Theory Fitness RD, and DomEx. For more information, please contact Carla Abusada at cabusada@gmail.com. UN/A Art-Visor provides experiences that insert their clients in the world of contemporary art, curing collections and designing spaces that truly reflect who they are and their unique sensibilities. They believe in the development of dialogues that encourage the interchange of ideas with their clients making them participants not simply spectators. ART. is a contemporary art gallery based in Santo Domingo, committed to carrying out the artistic culture of Dominications while helping emerging artists display their work. Miami native Marcel Katz is an art dealer and art agent, whose curated art gallery showcases available works from artists of all levels of fame and notoriety. In addition to helping independent artists break into the art world, Katz has often been the connector between them and today’s popular culture. Nicknamed “The Art Plug”, his creative marketing efforts and eye for predicting the success of artists and trends has attracted a younger generation of art collectors and admirers as well as celebrities. Katz has access to works from over 50 artists including Andy Warhol, Keith Haring, Takashi Murakami, Mr. Brainwash, Jeff Koons, Robert Indiana, Aholsniffsglue, CB Hoyo, Mister E, DetroitWick, and John Paul Fauves. Katz has collaborated other creatives in the entertainment industry, including D’Angelo Russell, Lil’ Wayne, Meyhem Lauren, DRAM, Miley Cyrus, Jermaine Dupree. Most recently, Katz facilitated a collaboration between Aholsniffsglue and Adidas on a targeted marketing campaign in Miami with street art culture. In 2017, Katz created the Miami-based agency The Art Plug as a consultation service providing bespoke solutions to a wide range of art-related needs. The Art Plug boasts a tight-knit team dedicated to lending a personalized touch to art advisory, curation, commissions, murals and much more. The agency is interested in collaborative relationships with clients and artists alike, and ready to to take a tailor-made approach to each project. Whether you are an artist in need of career guidance or a brand looking for art consultation, let The Art Plug be your plug. Marcel Katz is proud to participate in SCOPE Miami 2017 featuring Nigerian hyperrealist artists Arinze Stanley and Ayo Filade. The 17th edition of SCOPE Miami Beach returns to the sands of Ocean Drive and 8th Street. Featuring 140 International Exhibitors from 25 countries and 60 cities, SCOPE Miami Beach will welcome over 55,000 visitors over the course of 6 days. Amidst an unprecedented outpouring of critical acclaim from press, curators and collectors, and a digital and social media outreach campaign garnering over 450 million impressions, SCOPE Miami Beach’s is once again poised to lead the charge for emerging contemporary art market. SCOPE Miami Beach2017 will open with the Platinum First View on Tuesday, December 5, 12pm-4pm; followed by opens with its VIP and Press Preview on Tuesday, December 5, 4pm-8pm. The fair will run through December 10th; 11am-8pm Wednesday-Sunday. Rums of Puerto Rico and Sparkling ICE present “Mood Swings”: a group show of 20+ influential, trendsetting artists, both local and international, curated by Marcel Katz, at Oliver Cole Gallery during the world renowned Miami Art Week. We’re proud to have The Pink Lemonade and Arsenic as our media partners. Guests will be immersed with art in the stunning 5,000 square foot gallery in the heart of Wynwood Art District featuring available works and artist installations to provide an unforgettable, social media-friendly experience. The show will feature an activation room by artists DetroitWick & Black Crow Studios and The Caliber Foundation, a non-profit who supports victims, families, and communities affected by illegal gun violence. Activation Room : Raise The Caliber by artists DetroitWick & Black Crow Studios and The Caliber Foundation, a non-profit who supports victims, families, and communities affected by illegal gun violence.